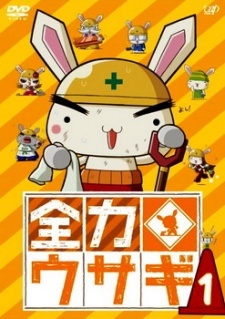 Zenryoku Usagi are hardworking construction builders — who happen to be rabbits — with a simple motto: "Zenryoku+Dai-ichi" ("Give everything you've got and be #1.") The animated shorts were aired in Japan within the Chibi Ani Gekijō (Tiny Anime Theater) program on Friday or Saturday mornings, depending on the station. Ikeda and Media Factory have created two books and numerous spinoff goods featuring the characters.